PRODUCT DESCRIPTION: Since most clothes and fabric which is colorful cannot be washed in hot water, allergens will accumulate and present a problem to people who are either wearing them or contacting them. 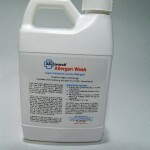 Allergen Wash is a highly concentrated detergent which is used by itself to wash clothing so that you can safely and effectively remove known allergens from anything being washed. 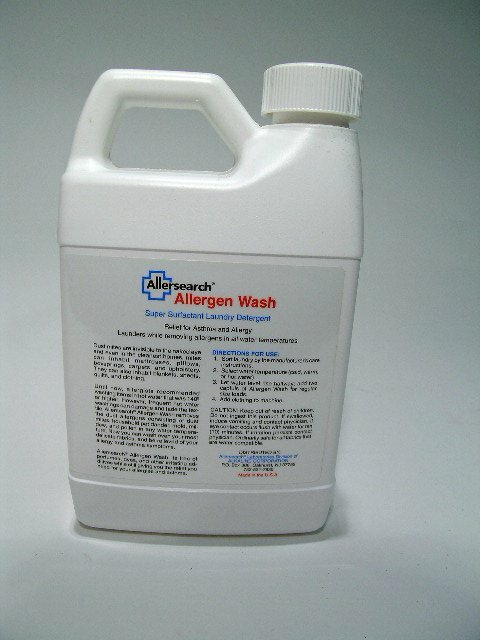 Free of odor and irritating additives, this wash is an excellent way to help remove and minimize known allergen exposures to anyone with allergies. TARGETS: Just about any allergen like those caused by dust mites, pet dander, mold, mildew, pollen, etc. WHERE TO USE IT: In place of regular laundry detergent. This highly concentrated formulation is used in the washing machine like any other detergent for all types of clothing, fabric, etc. RATE OF APPLICATION: Just two cap fulls per medium load which means you get up to 30 medium loads from one 24 oz jug.